Navid Hamid (left) with Peter Verbinnen at the Second Cup café in Southampton. Second Cup, a speciality coffee chain from Canada, has opened its first café in Southampton, Hampshire. The franchisee, Navid Hamid, has launched the café after securing a start-up finance package from HSBC. 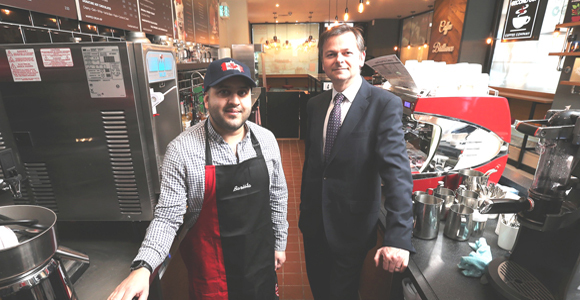 Hamid who trades as Jaan Capital Partners Ltd, has created 18 new jobs for the local community in the new 75-seat café, which includes managerial staff and baristas. Second Cup offers a host of hot and cold drinks, as well as a variety of sandwiches and pastries. The company says it uses unique brewing equipment to prepare fresh and custom-made coffee, using sustainably sourced coffee beans from some of the most socially and environmentally conscious farms around the globe. Hamid commented: “Launching my first store has been an incredible experience and Peter Verbinnen, my HSBC relationship manager, has made the start-up process incredibly smooth. Jane Fancy, HSBC’s area director for Hampshire and Dorset, said: “Second Cup is passionate about high-quality, responsibly-sourced coffee and organic teas so we were delighted to help Navid bring such a fantastic brand to Southampton for the first time. Second Cup started retailing coffee in Toronto, Canada, in 1975 and has since expanded globally across 33 countries with over 300 cafés. The company currently has nine branches in the UK.